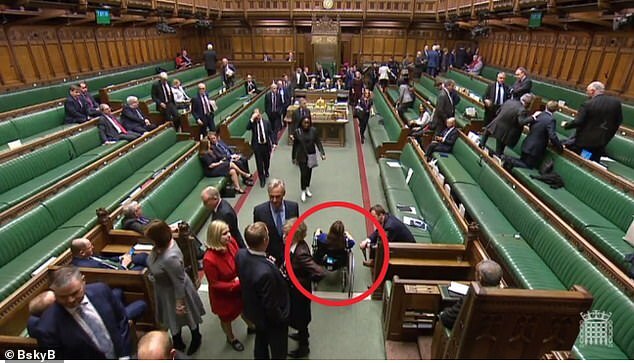 Pregnant Labour MP Tulip Siddiq was wheeled into the Commons to vote in last night’s crunch showdown after being accused of delaying her caesarean to ‘make a point’ on Brexit. 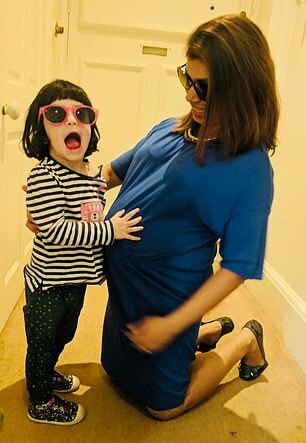 Ms Siddiq, 36, revealed on Monday that she had decided to go against doctors orders and delay the delivery of her unborn son so she could vote against the PM’s Brexit deal. And she was seen being pushed through the division lobbies in a wheelchair to take part in the historic vote. The MP, who has a two-year-old daughter Azalea, decided to travel to Parliament after losing faith in the system which allows pregnant women to be ‘paired’ with an MP from an opposing side so neither votes. 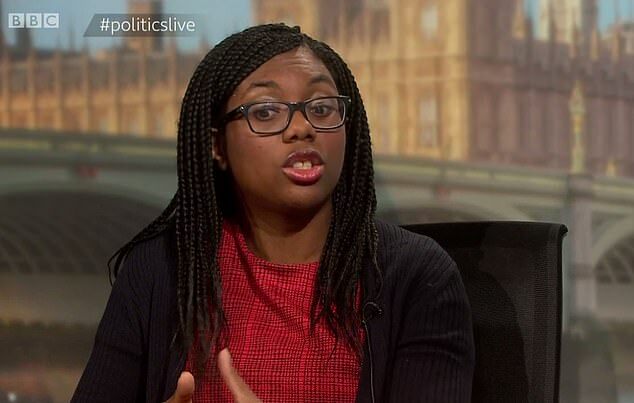 But appearing on TV yesterday, Tory MP Kemi Badenoch said she thinks MS Siddiq made the decision to prove a point to her pro-Remain constituency ‘irrespective of pairing’. Her comments were lashed by Labour MPs who accused Ms Badenoch of making a ‘scurrilous slur’ and ‘appalling smear’. Ms Badenoch was asked on the BBC’s Politics Live show about Ms Siddiq’s decision and whether it shows that Parliament should introduce proxy voting. She said: ‘I have heard her speak on this issue privately before, and I think irrespective of pairing I think she wants to make a point that she is doing this for her constituents. What is the pairing system and why have MPs lost faith in it? Parliament has operated a pairing system for many years which allow those who are ill, pregnant, or cannot vote for another good reason. These MPs are ‘paired’ with a politician from the opposing side, so that neither of them take part in the vote – therefore cancelling each other out. But faith in the system was dealt a major blow last summer when the Tories broke it. Lib Dem Jo Swinson had been paired with Tory chairman Brandon Lewis so she did not have to leave her newborn baby at home to take part in the vote. But Mr Lewis took part in the knife-edge vote on the customs union on Monday night. Number Ten insisted it had been a genuine mistake and that Theresa May apologised for it. But it sparked a major row and renewed calls for proxy voting to be introduced which would allow MPs to elect another person to vote on their behalf. And she said that if the predictions that Mrs May’s Brexit deal will be defeated by a landslide of up to 200 prove true then Ms Siddiq’s vote will make no difference anyway. She said: ‘If what we are hearing is true and there are hundreds and hundreds of people voting against it [Theresa May’s deal] that one vote is not really going to make a difference. Labour MP Jo Stevens demanded to know if Ms Badenoch spoke to Ms Siddiq before making the claim on live television. While Labour MP Stephen Doughty accused her of making an ‘appalling smear’ and Labour MP Sharon Hodgson said it was a ‘scurrilous slur’. Ms Siddiq was advised by her doctors at the Royal Free Hospital in north London to have her caesarean last night after she developed gestational diabetes. But she decided to defy doctors orders and delay the operation to have her son so that she could vote against the PM’s Brexit plan last night. 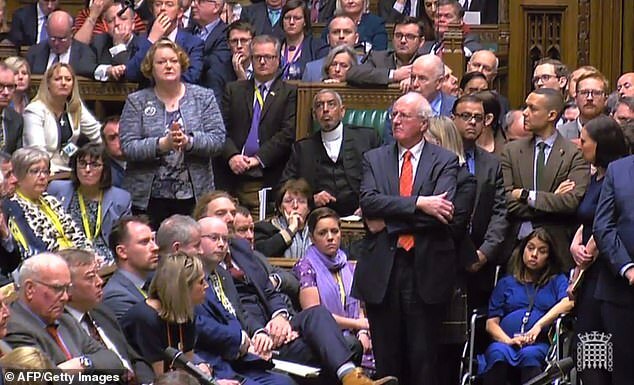 She said that she had lost faith in the pairing system after the Tories broke the pact when one of their MPs was paired with Lib Dem Jo Swinson in another key Brexit vote last summer. And she called for the parliamentary authorities to change the rules introduce proxy voting so that heavily pregnant MPs like her can ask another MP to vote on their behalf. Under usual circumstances, heavily pregnant MPs can be ‘paired’ with an MP from the opposing side, so that neither of them take part in the vote – therefore cancelling each other out. But Ms Siddiq said she could not trust the Tories to stick to the system after they broke a pairing deal in a crunch Brexit Commons vote last summer. Number 10 insisted it had been a genuine mistake and that Theresa May apologised for it. Ms Siddiq said the experience had sapped her trust in the pairing system. She said: ‘If the pairing system is not honoured, there’s nothing I can do, and it’s going to be a very close vote. I’ve had no pressure at all from the whips to come and vote but this is the biggest vote of my lifetime.